How effective is the Cloud at reducing vibration? We can prove it! There are many vibration control products in the audio market today. Most of them claim to use proprietary technology to reduce vibration, but often lack any real data to prove conclusively that it does. We at Gingko Audio can prove how effective our patented Cloud platform is with a real-time demo that has been shown at numerous audio shows since 2004. Consider this model of how vibration affects an audio component on a rack shelf. 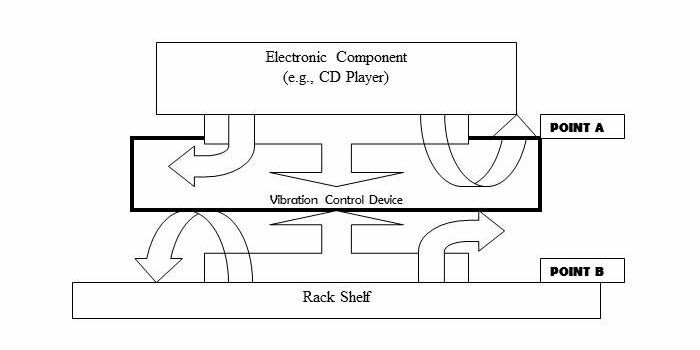 Figure 1 shows a typical audio/video device sitting on a vibration control platform which, in turn, rests on a shelf. The downward facing arrows from the device depict the flow of energy from vibrations in the equipment to the device. The upward facing arrows show how vibration energy flows from the shelf to the device. Simply put, vibrational energy impinging on an object can do three things: Reflect back to the source, be absorbed by the object, and be transmitted through the object. The primary function of an effective vibration control device is to maximize the absorption. To understand how well the vibration control device in Figure 1 does its job, we can measure the amount of vibration on two points, A and B, and compare the results. We mount identical transducers at each point and, using instrumentation, observe the effects of vibration under controlled circumstances. Each transducer generates a voltage proportional to the vibration at its base and feeds a spectrum analyzer that simultaneously displays the frequency and intensity of vibrations at both points on the screen of a laptop computer. We conducted these demos using two identical Bruel & Kjaer 4371 accelerometers affixed to Point A (top of the Cloud platform) and Point B (the rack shelf), feeding vibration signals to two identical Bruel & Kjaer conditioning amplifiers Type 2626, which in turn send the resulting vibration readings to an IBM ThinkPad PC with Spectrogram software developed by Richard Horne. Below is a video by AVShowrooms showing the live demo at T.H.E Show Newport in 2013. The vibrations on the two transducers are shown on split screens with each showing real-time vibration measurements as a function of time (X axis) and frequency (Y axis). The black line on the top of each chart shows the amplitude modulation trace indicating the summary of vibrational intensity across all frequencies and over time. The lower colored portions show the vibration present over time and by intensity of particular frequency. The horizontal axis represents time, the vertical axis displays the logarithmic spectrum analysis plot from 20 to 22,000Hz (the bottom is 20Hz, the top is 22KHz). Higher color temperatures indicate stronger vibrations. The colored representation progresses from red for worst to yellow, green, light blue, dark blue, then white for best. The colors and the corresponding vibration levels from -30db to -60dB are depicted here on the input screen of the Spectrogram software program used for the tests. As an example, Figures 2A and 2B show the split-screen comparison between no isolation on the left vs. isolation via the Mini-Cloud on the right. Each comparison is done with a frequency sweep from 20Hz to 22KHz on a logarithmic scale (Figure 2A) and an actual music signal from Copland’s Fanfare for the Common Man [Reference Recordings, Minnesota Symphony under Eiji Oue (Figure 2B).